Thank you for your question. Unfortunately we would not recommend our cartridges to be used in a machine purchased outside of the U.K. The cartridges in my Epson XP102 printer aren't stopping in the right place so I can't get the new ones in. Please help? How do I remove ink cartridges from the Epson XP-102 printer to put in new ones? Can you post XP102 ink cartridges to my address in Gibraltar? I'm happy to pay any extra postage. Thanks. Sorry, we only post to UK addresses which is a free delivery service. When I put the compatible black cartridge into my XP-102 printer a message from Epson came up that it was "unknown" to Epson. Acccording to the description on your website it is compatible with the XP 102. Is it safe to use and will it harm my printer? Could you show me how to remove and replace the cartridges in an Epson XP102 printer? Hello, I have an Epson XP-102 Expression Home printer with Claria Ink. Am I right that number 18 or 18XL cartridges work in this printer? If so, do you have any and at what price? Yes, we do stock the genuine Epson 18 and 18XL ink cartridges with Claria Home Ink for the Epson Expression Home XP-102 printer. Any of the cartridges in the Daisy packaging are original Epson XP-102 ink cartridges. The Epson 18 cartridges are standard capacity inks whereas the Epson 18XL cartridges are high capacity inks. All current prices are listed beside each item on the right-hand side of the page. How do I change the ink cartridge in my Epson XP-102 inkjet printer? I looked on Friday and you had the cheaper ink cartridges for an Epson XP-102 but now they're not loading. Do you still have any? We're sorry that you appear to have had a problem displaying our web page properly. We do stock cheap compatible Epson XP-102 ink cartridges. You should be able to see them listed on this page under "Premium brand recycled Epson XP-102 ink cartridges". If you still can't see these items we suggest that you refresh your browsing session or you can contact a member of our friendly telephone support team for futher assistance. Can you please advise how much ink is actually in Epson XP-102 original cartridges? Thank you. Best used in the home, the Epson XP-102 (Expression Home) multifunction printer offers excellent print quality whether producing everyday documents, graphics print outs or even photographs. The Expression Home XP-102 all-in-one offers vibrant colours and respectable print speeds, especially when it comes to monochrome printing. However, the Epson XP-102 slows down when printing in colour, though it still offers respectable colour print rates. The XP-102 colour multifunction printer from Epson is a good choice for home use, though it does not offer fax capabilities. The Epson Expression Home XP-102 is a small inkjet printer. It combines the functions of a printer, copier, and scanner in one device and offers full colour operation, unlike other units that only offer black and white printing. It has a 50-sheet paper feed and it uses individual inks to save on ink costs. 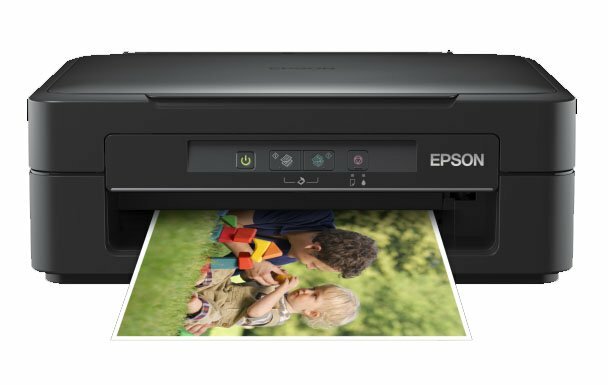 The Epson XP-102 multifunction printer is also Energy Star qualified, making it one of the most power-efficient devices in the market. The best features of the Epson XP-102 all-in-one inkjet printer include its high-speed USB connectivity, which means more productivity, thanks to fast data transmission. The Epson XP102 prints fast, with a monochrome rate of up to 26 ppm, though colour printing is a lot slower at 13 ppm. Photo printing is excellent, and scan results are also impressive using the Epson XP-102 colour inkjet printer. This device can use high capacity Epson XP-102 ink cartridges to reduce expenditure on printer ink over time. However, the Epson XP-102 Expression Home printer does not offer network connectivity, nor does it have memory card support. Nevertheless, the Expression Home Epson XP102 is still a good choice of printer for home use.